As well as wet glue, flexographic and short run digital print we offer our customers wide format Eco-solvent printing on a Roland SP-540V. 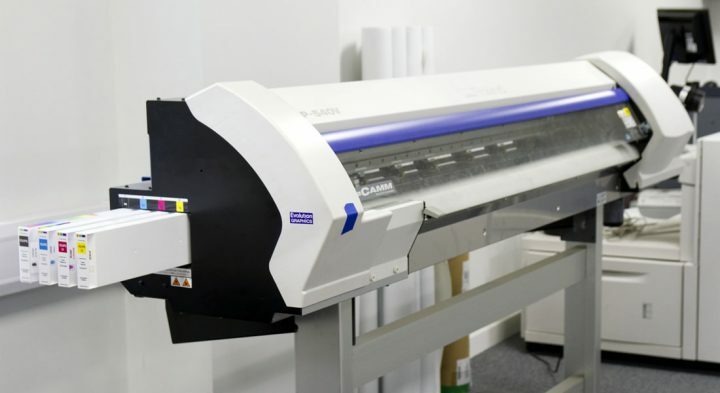 This utilises ink-jet technology to print full colour artwork and images onto a vast range of substrates at a width of up to 1350mm. This gives us the ability to take care of our customers signage and display requirements and the printed material can be applied to a variety of display board including foam, aluminium and corrugated plastic. We also have the ability to produce display banners which can be hemmed and eyeletted on site for hanging. Our equipment also allows us to produce work for exhibition stands and pop-up displays and once again we aim to make the print consistent with our customers branding. Our Roland printer can also print and cut small run labels onto self adhesive vinyl by tracking any shape cutter from our customers artwork files. This gives us the ability to produce complex label shapes ideal for point of sale.